I don’t usually follow recipes, but I’ll try to estimate about how much of everything I put in. Sauté the leek, onion, carrot and a pinch of salt until softened. Add the ginger, garlic, cayenne, and five spice and sauté until fragrant, 30 seconds to a minute. Add the stock and squash and simmer until tender. Puree, in batches if necessary, and add more hot stock or water to reach a creamy consistency. Stir in the lemon juice off the heat. Top with a dollop of whipped crème fraiche, fresh chives, and thinly sliced pickled ginger for garnish. 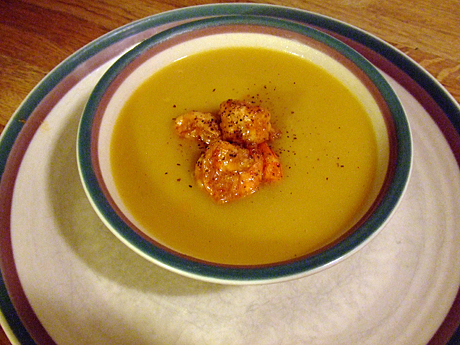 Now, I’ve never tried five spice powder in a squash soup — but it makes perfect sense. And all those warming spices are perfect for this time of the year!